Last night, Matt Cain threw the first major league perfect game in nearly two months! He threw the first individual no-hit game in nearly two weeks! He threw the first no-hitter of any kind in five days! He did throw the only no-hit game of the night, though R.A. Dickey didn’t get one in St. Petersburg only because of a dubious scorer’s decision that might yet be reversed, and Felix Doubront carried one through two out in the sixth. Look, I yearn to witness a perfect game, still kick myself for skipping one one year because it was too cold (David Wells, 1998) and another the next because it was too hot (David Cone, 1999) like some baseball fan version of Goldilocks. And there is no offense meant to Matt Cain, or Phil Humber, or Roy Halladay, or Dallas Braden, or Mark Buehrle, or for the man whoshouldalso be on this list, Armando Galarraga. But as of the morning of July 23, 2009 – less than three full years ago – there had been exactly 17 perfect games in the 139 seasons of organized big league baseball. In the 34 months since there have been five of them (really, six). In the game’s first 139 seasons we had had one year in which there were two thrown. In the last three seasons, we have had one year in which there weren’t two thrown. Five of the last fifteen individual no-hitters have been perfect games. There have been so many of them now that Ted Barrett has now been the home plate umpire in two of them, and his colleague Brian Runge has worked two of them this year (he was at 3B last night, and behind the plate for Humber’s, and, oh by the way, he was also behind the plate for the Mariners’ combined no-no last Friday). Cain’s was the 22nd of all-time (the total should be 24: Galarraga should’ve gotten his, and Harvey Haddix’s flawed 13-inning gem should be counted somehow even though it isn’t). If the frequency at which they’ve occurred over the last three years had applied to all of baseball history, we wouldn’t have had 22 perfectos, we would have 91 of them. I understand there are historical anomalies in the game. 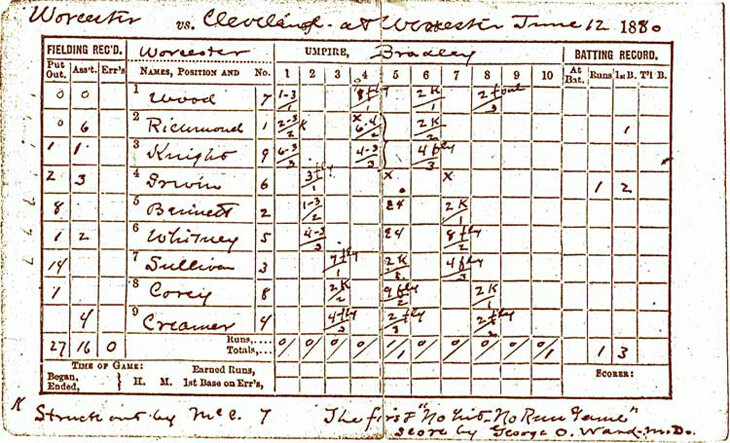 One of my favorite factoids is the mind-numbing truth that an enterprising fan in the northeast could’ve seen Lee Richmond throw the first one in big league history on Saturday June 12, 1880 for Worcester of the National League, and then could’ve turned up just five days later in Buffalo to watch Johnny Ward throw the second one for Providence of the N.L. But if our hypothetical spectator had wanted to make a hat trick out of it and see thethirdperfect game ever pitched in the National League, he’d have had to chill for 84 years because the next one wouldn’t be pitched until June 21, 1964, by Jim Bunning at Shea Stadium. Bizarre statistical thunderstorms occur. We had two batting Triple Crowns in 1933 and five out of a potential ten in the five-year span ending in 1937. The American League had one (by Frank Robinson) in 1966 and another (by Carl Yastrzemski – with a tie in the homer category) the next year. Not only has nobody performed the trick since but the seven I’ve just mentioned account for sixteen of all of them dating back to the first by Paul Hines in 1878. See my point? I have argued here for two more of the men on this list to be in Cooperstown but in point of fact only one of them (Gibson) is. A derangement of the pitching-hitting balance will make some fair pitchers good, some good pitchers great, and some great pitchers immortal (remember, 1968 was also the only time since 1934 that anybody – in this case McLain – has won as many as 30 games in a season). And it applies to hitting, too. We like to forget the fact that an incredible percentage of fans and an almost equal number of credulous reporters saw nothing at all wrong with the idea that all six of the seasons in which somebody hit more than 61 homers occurred between 1998 and 2001. I can remember clear as a bell the late, great Leonard Koppett trying to convince me and Jim Bouton on my tv show that the discovery of androstenedione in Mark McGwire’s locker had absolutely nothing to do with anything and wouldn’t be remembered by anybody. I’m not saying the pitchers are juiced and I’m not saying there will be a mental asterisk placed some day on Cain’s perfect game, or Humber’s, or anybody else’s. I’m not even saying that I’m fully invested in the most obvious theory of what’s going on: that the subtraction of Performance Enhancing Drugs has left a generation of hitters who have known nothing but to swing from their heels with no gas in their tank (although Cain’s victims, the Astros, have now struck out 505 times in 62 games – that’s 8.2 per game – and have averaged nearly 12 per game this month, meaning from their perspective, their 14 K’s against Cain last night was only a little worse than usual). What I am saying is that to respond to Matt Cain’s perfect game by simply jumping up and down and buying souvenir merchandise is to miss a bigger picture, one that isn’t exactly clear yet. But when you get five (six?) perfect games in three calendar years, and you get 37-year old knuckleballer R.A. Dickey suddenly launching into territory in which he has struck out 50 and walked 5 in his last 47 innings, and he’s 10-1 and former middle reliever Lance Lynn is 10-2 and Chris Capuano – with one previous winning season since 2003 – is 8-and-2, some kind of tipping point has been reached and maybe all the pitching is just as incongruous as was all the hitting in 1998-2001.